Stuck In The Buckosphere: Fun weekend. 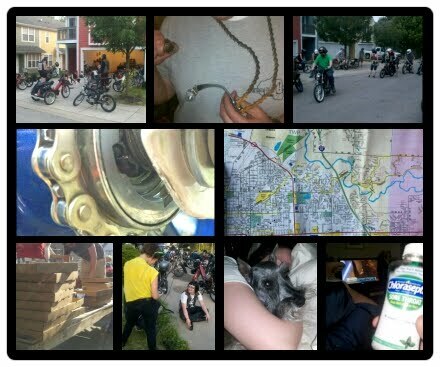 Lafayetis moped rally & getting sick. Fun weekend. Lafayetis moped rally & getting sick. The weekend was a lot of fun. Nick and I were the only Dayton mopeders who went out to Lafayette, IN. We were lucky enough to be housed up with Dylan Chubbs and his house-mates. They were super accommodating and made one heck of a filling breakfast Saturday morning. The Friday night rides were fun around the city of Lafayette and then finishing up the night at a pinball arcade downtown and then at one of the Yeti's house. Their moped club is the Lafayette Yetis, or Lafayetis. I stayed up a little later than I wanted to because I could feel the sickness coming on, but still went to bed before most of the others. During the Friday night ride I bent my pedal chain tensioner. I think the chain got caught and it bent the metal backward. Easy fix that night with a vice and back in running order. There were about fifty mopeds for the ride on Saturday and it was a nice ride around the countryside in Indiana. Bike was running great...until I blew a bearing. My rear wheel axle bearing lost a few of the ball bearings somehow and nearly locked up the rear wheel. I have no idea how that happened, but it will be an easy fix. All I can figure is a factory defect. I had to load my bike on chase and then we picked up my truck which I then used to pick up other stranded bikes along the route, which turned out to only be one. The one thing that I really thought was a good idea was that all the money people pitched in for the stacks of pizza would get you a raffle ticket per dollar. This way you not only feel like you are giving money for the raffle, but also for the pizza. Love that idea. Nick and I did not win anything, but still fun and the pizza was awesome. We left Saturday evening to come back, even though the Yetis still had more rides planned. We both needed to get home, which was the BEST decision because yesterday I laid on the couch most of the day drinking soup and watching Star Wars. Dawn also made me a super hot buffalo chicken dip which helped me sweat off some of the illness. I have the world's best wife. The weather today will be the wettest of the week ahead. A cold front is pushing into Indiana currently and has been triggering showers and storms yesterday and last night. Now that the sun has set it has lost most of its power, but once the sun comes back up, it will help trigger more showers and storms to redevelop. The Western counties will likely see the least chance for rain because the cold front will be pushing to the east as the energy builds. A few lingering overnight and showers early tomorrow to the far east are possible, but the best chance for rain will be later today... mainly between noon and sundown. Temperatures will be "warm" the next couple days... 80 today, 72 tomorrow, and then 79 Wednesday. I use the term loosely because compared to next weekend, it will be cool. With all the sunshine, for the rest of the week after today, we will bounce back to 85 Thursday, 87 Friday, 90 on Saturday, and then clouds and rain finally look to roll in next Sunday, with a high of 86. The rain next Sunday is still a little iffy and will be scattered as it appears now. I will keep you posted, but get the air conditioner fixed now if it needs repaired. Stay dry today and have a good one. Looks like a really fun weekend for you. We had fun, too, with lunch on the river. Today, though, we'll drive North to visit my brother near Columbus. I hope we can drive between the rain drops.